Morning rain to snow and flash freeze, then clearing. Windy and cold. Temperatures fall into the 20s. Overnight Friday: Windy and cold. Lows around 10, wind chill below zero. 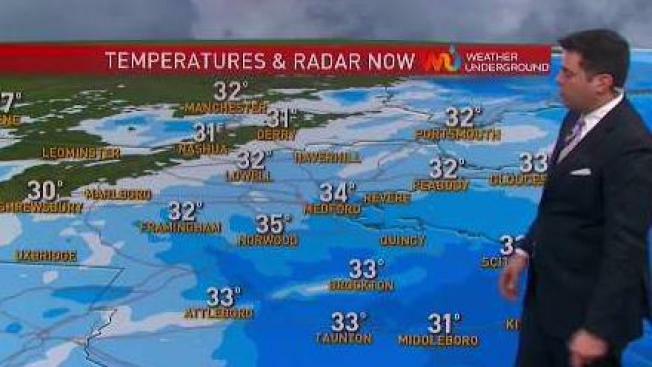 February started off with mild conditions for much of New England yesterday, even as the mountains saw a few inches of snow, others saw snow melt. Then a cold front came in at midnight with new cold and rain changing to snow. Now we all get an icy coating to 1-3 inches of snow during the morning commute. Adding to the challenge is colder air racing with sunrise, so pavement, especially untreated steps and walkways that are still wet and slushy become icy in a jiff. Snowfall at the rates of one inch per hour are possible for an hour or so, ending from northwest to southeast between 6 and 9 a.m. Temperatures that start near freezing continue falling through the 20s during the day, into the 10s north, despite plenty of sunshine. Wind increases from the west and northwest 20 to 30 miles an hour adding an extra chill. Cold high pressure tracks south of us tomorrow allowing for a quick rebound from temperatures starting around 0 degrees north to 10-20 degrees south, by afternoon we warm to the 10s north and 20s to near 30 in southern New England. Sunshine fades quickly with clouds returning and snow developing at night for Vermont, New Hampshire, and Maine. Low-pressure will strengthen and cross over New England Sunday evening, with snow inland, and snow changing to rain at the coast for our Super Bowl Sunday. In areas that do see a change to rain, precipitation may change back to snow before ending Sunday night or early Monday. Snowfall amounts of 6 to 12 inches are likely well inland. Only minor accumulation, but ultimately icy conditions near the shore. Much like our Friday, Monday weather features cooling air during the daytime, with increasing sunshine and temperatures falling through the 20s. This weather pattern is kind of stuck in the same mode most of next week. A cold start on Tuesday, warmer on Wednesday with a mixture of snow and coastal rain or snow changing to rain at the coast. An almost identical set up to Monday, repeats on Wednesday. Then it turns colder and dry for Thursday, and we may do the same thing again late next week. It is a lot of precipitation over a 7 to 10 day period. In the mountains it will result in a couple of feet of snow and what may add up to inches of rain at the shore. But because any warm-up lasts only several hours, we will probably have a lot of ice on our fields, and untreated sidewalks and side roads where there are days with rain next week. The pattern also yields low confidence in the forecast. Any slight change in timing and track of individual energy centers, results in large day to day change in forecasts. It looks like a very busy weather pattern through Valentine's Day at least.